Located in the foothills above the Kohala Coast lies the charming Waikoloa Village. 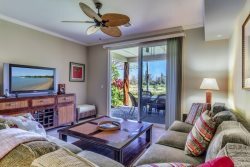 Guests of the Waikoloa Village villas will enjoy serenity and privacy surrounded by pristine landscaped grounds, with a pool, hot tub, golf course and much more. The Waikoloa Beach Resort is just 7 miles away and offers two outdoor shopping centers and many other amenities. Hapuna Beach, Anaehoomalu Beach, and Kaunaoa Bay are all nearby, offering a variety of beachside recreational opportunities. Our Waikoloa Village properties are shown below. We offer a starter supply of all basic items you will need for your vacation, including items for the kitchen and toiletries for the bathrooms. And as always, our Concierge services can provide you with anything else you desire for your vacation. Reserve your Waikoloa vacation rental today, and get the best rate when you book direct with ResorticaHawaii. Contact us directly with any questions.